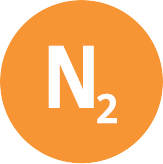 Need compressed, liquid and various mixtures of nitrogen (N2)? The Oil and Gas industry uses nitrogen to increase reservoir reserves, and to fracture hydrocarbon-bearing formations to increase oil and gas production. In refining applications, nitrogen is used to blanket storage tanks and purge pipelines, strip Volatile Organic Compounds (VOCs) from chemical process streams and wastewater, and to reduce VOC emissions. Please see the table below for information and to access safety data sheets on nitrogen available from WestAir. The Food & Agriculture industries use nitrogen as cryogenic agent in cooling, chilling and food freezing. Liquid nitrogen is the fastest freezing method for producing Individually Quick Frozen (IQF) foods. Nitrogen also plays a key role in reducing spoilage, discoloration and off–flavors, strengthening retail packaging. The Aerospace and Shipbuilding industries use nitrogen as an assist gas for laser cutting applications. Nitrogen plays many roles in the Lab & Life Sciences industries: Nitrogen NF is used to freeze and preserve blood, tissue, and other biological specimens. Nitrogen also freezes and destroys diseased tissue in cryosurgery and dermatology. Liquid nitrogen is also used with a variety of lab equipment, such as cold traps, gas adsorption systems, and NMR and MRI instruments. Gaseous nitrogen is used to protect a process from moisture intrusion, oxidation, degradation and contamination (e.g., purging, pressure transferring, mixing and blanketing). The Lab & Life Sciences industries also use gaseous nitrogen as a carrier, diluent, or nebulization gas in various analytical instruments. In Metal Fabrication, nitrogen is used as a purge gas, and as an assist gas for laser and plasma cutting.